The park brake cable adjusting nut is a nylon lock type. Use ONLY HAND TOOLS whenever tightening or loosening the adjusting nut. Apply and fully release the park brake several times. 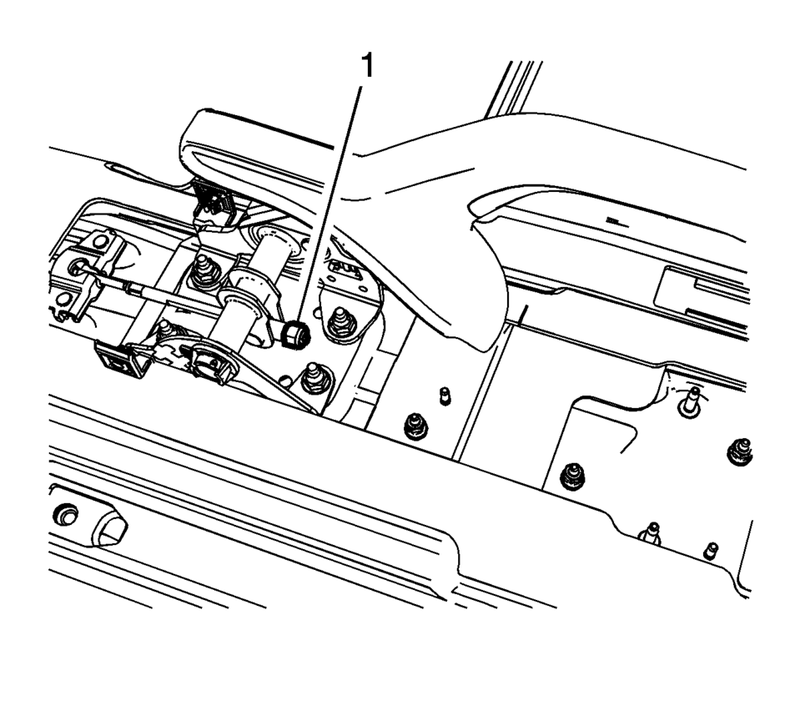 Verify that the park brake lever releases completely. Turn ON the ignition. Verify the red BRAKE warning lamp is not illuminated. The park brake lever is in the fully released position and against the stop. There is no slack in the park brake cables. If the red BRAKE warning lamp remained illuminated and there were no other visible causes, refer to Symptoms - Hydraulic Brakes. With the park brake lever in the released position, loosen the adjusting nut (1) enough to completely relieve tension on the front cable. Raise and support the vehicle. Raise the vehicle just enough to allow rear tire and wheel assembly removal and rear drum adjustment. Refer to Lifting and Jacking the Vehicle. Remove the rear tire and wheel assemblies. Refer to Tire and Wheel Removal and Installation. Adjust the rear drum brakes. Refer to Drum Brake Adjustment. Ensure there is no brake shoe drag after adjustment by rotating the brake drums. If drag exists, re-center the brake shoes and perform the brake shoe adjustment again. Install 2 wheel nuts to the wheel studs and firmly hand tighten in order to retain the brake drums. Fully release the park brake lever. Tighten the park brake cable adjusting nut (1) until the threaded portion of the front park brake cable extends beyond the adjusting nut approximately 27 mm (1.06 in). Apply the park brake lever. Attempt to rotate the rear brake drums. There should be no rotation forward or rearward. Verify the park brake is released by rotating the rear brake drums. The drums should rotate freely and exhibit no brake shoe drag. If the drums do not rotate freely, repeat the park brake cable adjustment procedure. One of the brake drums should not rotate forward or rearward. The other brake drum should not rotate forward or rearward, or should require substantial effort to rotate. Raise the park brake lever one additional detent position and attempt to rotate the rear brake drums. Verify that the left and right brake drums cannot be rotated. Remove the wheel nuts retaining the brake drums. Install the rear tire and wheel assemblies. Refer to Tire and Wheel Removal and Installation. Install the front floor console. Refer to Front Floor Console Replacement. Release the park brake lever.